Join us for Revolution Gallery’s first “Retro Rewind” Dance Party of 2019! 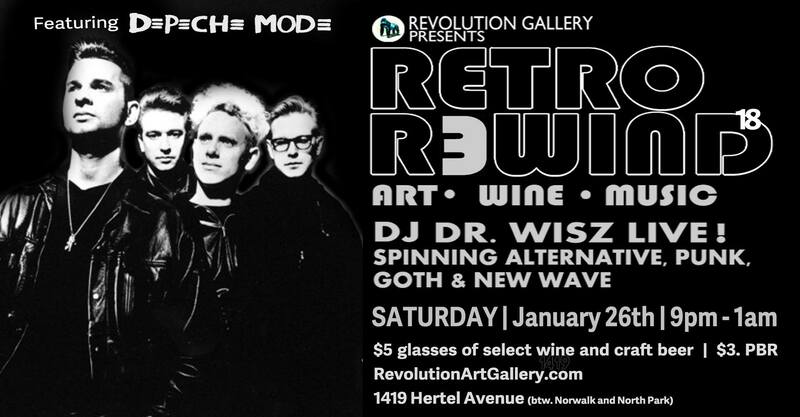 DJ Dr. Wisz brings his vinyl selections to the gallery for this 18th edition of Retro Rewind – spinning 80s and 90s Alternative, Punk, Goth, New Wave… and featuring Depeche Mode! Go Retro with us from 9:00pm to 1:00am. $5 glasses of select wine, $3 PBR, $5 local select craft beer!